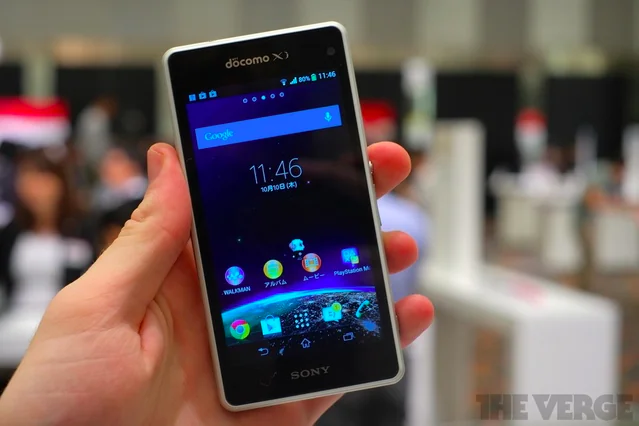 Well what do you know, Android “mini” smartphones may not be gaining traction among consumers but that isn’t going to stop manufacturers from making smaller versions if their flagship devices, Japanese telco, NTT Docomo just officially took the curtains off the Sony Xperia Z1f, a 4.3” 720p version of the Sony Xperia Z1. The device was showcased at the telco’s annual winter/spring lineup along with 15 other new mobile devices. As seen in the rumors, unlike other mini smartphones, all Sony did to the Z1F was shrink down its size to 4.3” with a 720p resolution display, pack in a smaller battery (of course) of 2,300mAh, while retaining all the specifications that makes the Z1 stand out. Looking just slightly larger than an iPhone 5, the Z1F packs the same amazing 20MP rear camera with G Lens, 2.2GHz quad-core Snapdragon 800 processor, 2GB of RAM and runs on the telco’s 150Mbps LTE network. As with the Z1, it has a water and dust proof construction made of glass and aluminum. According to NTT Docomo, the Z1F is an exclusive model for them, so we have no idea if the “Xperia Z1 mini” will ever make its way out of its home country. Will you prefer a smaller Xperia Z1 or do you think 5” is the perfect size? [OPINION] Please Stop With Incremental Device Updates, We're Not THAT Stupid. Or Are We?